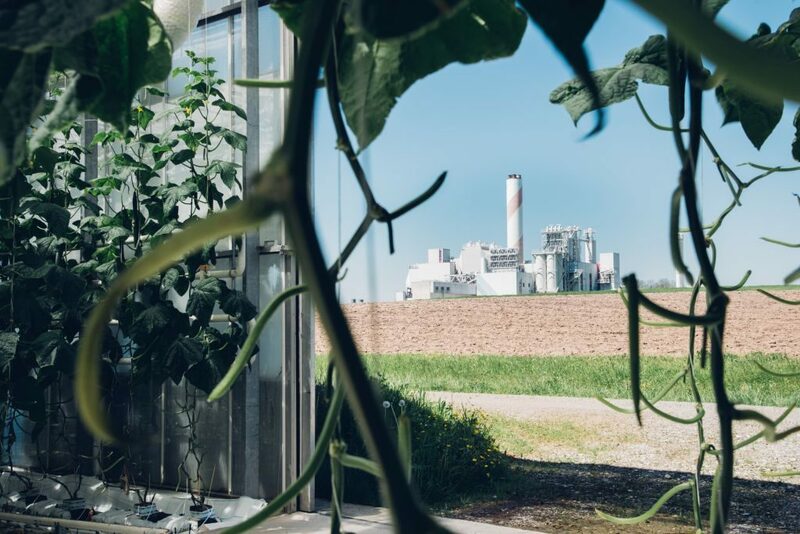 Climeworks along with the project partners KEZO, Gebrüder Meier and the Swiss Federal Office of Energy has commissioned the world’s first commercial plant to capture CO2 from air in Hinwil, Switzerland. The plant filters 900 tons of CO2 from the atmosphere every year and supplies the gas to a nearby greenhouse to help grow vegetables. Climeworks direct air capture (DAC) technology mainly needs low-grade heat as an energy source. In Hinwil the DAC plant is installed on the roof of a waste to energy facility – operated by the municipal administration union KEZO – with its heat powering the Climeworks plant. During the process, CO2 is chemically deposited on the filter surface. Once the filter is saturated, the CO2 is isolated at a temperature of about 100 °C. The pure CO2 gas can then be sold to customers. In Hinwil, Climeworks provides a continuous supply of CO2 through an underground pipeline to a greenhouse 400m away, operated by Gebrüder Meier AG, to assist with growing vegetables. Climeworks’ plants are modular, scalable and can be located independently of emission sources, allowing security of supply wherever there is atmospheric air. Importantly, our plants enable a carbon negative future when combined with underground storage of CO2 which will be vital in the quest to limit a global temperature rise of 2 °C. Compared to other carbon removal technologies, direct air capture does not depend on arable land, has a small physical footprint, and is fully scalable. 900 tons of CO2 are removed from the atmosphere every year. The CO2 is injected to a nearby 40’000m2 greenhouse where the additional gas leads to an increase in crop yield of up to 20%. The CO2 capture plant need heat at 100 °C to operate. This heat is sourced from the KEZO waste to energy plant. Through this additional delivery of low grade heat, KEZO can increase its overall efficiency. Along with the CO2, part of the air’s humidity is captured by the Climeworks plant and made available as fresh water. The main challenge for Climeworks in the short term lies in detecting the best possible sites for its plants. On optimal sites, sources of heat at around 100 °C, electricity, as well as a customer and application for the CO2 gas are available within short distances. In the mid to long term, Climeworks main challenge lies in further reducing the cost of its technology so that novel large scale applications for CO2 such as the production of CO2 based synthetic renewable fuels are enabled. The goal is to reach costs of below 100 Euros per ton of CO2. From a political and regulatory perspective, a strong and internationally coordinated carbon pricing mechanism will be important as this will finance the combination of DAC with safe underground storage of CO2 and thereby enable a partial reversal of climate change which is vital in order to limit global warming to 2 °C.